Each year, the ACM Student Research Competition (SRC) — sponsored by Microsoft — is presented at well-known ACM sponsored and co-sponsored conferences before a panel of judges and attendees, with the aim of awarding first-, second-, and third-place honors to both undergraduate and graduate research projects. The North American SIGGRAPH conference is no exception. 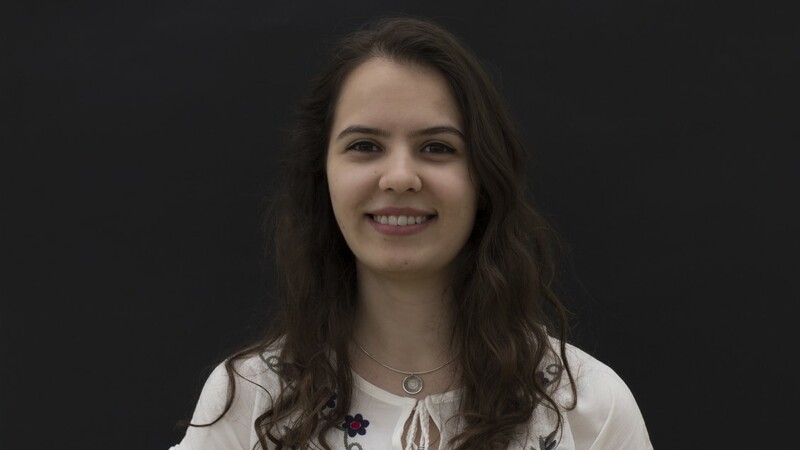 We caught up with SIGGRAPH 2018 first-place undergraduate winner Bianca Cirdei to learn about her project and her experience both at and since last year’s conference. It’s amazing — and maybe even scary — how well-preserved some fruits can be! 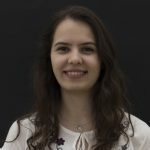 Bianca Cirdei (BC): My winning project was developed as part of a course called “Innovations Project,” run by the National Centre for Computer Animation (NCCA) [at Bournemouth University] during the final year of the undergraduate computer visualization program. During this course, I had the freedom to select a project theme according to my specialism, with the aim of producing experimental or innovative results which either expanded the existing works of art or brought completely new approaches to computer graphics topics. The course is run by Dr. Valery Adzhiev and, with the help of my mentor and collaborator Dr. Eike Falk Anderson, this project slowly took shape. The idea for the project started after I analyzed and updated my knowledge on the latest themes approached by researchers in computer graphics. During this process, I found some captivating and interesting articles on fruit senescence, morphology changes in drying leaves, fruit dehydration, and, above all, the stunning visual aspects of this natural process. I felt there wasn’t enough attention given to this process and was determined to look into these aspects further. Considering that my career aims involve developing technical skills and expanding my simulation knowledge, this was a perfect context. 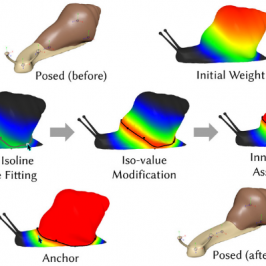 [Ultimately, the direction I chose] merged my passion for research with making use of mathematical models to develop a physically and biologically correct simulation. 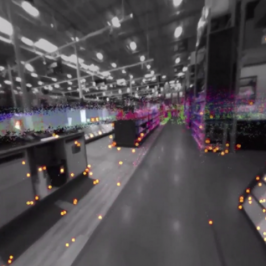 SIGGRAPH: Share what’s happened with your research since it was presented at SIGGRAPH. BC: Since presenting my research at SIGGRAPH I have always tried to find methods of implementing the suggestions and feedback that I received from the graphics enthusiasts and specialists to try and tailor this project into a tool that artists can make use of. The greatest most recent achievement, though, is being a co-author alongside Dr. Eike Falk Anderson and Dr. Valery Adzhiev for a paper outlining how successful the project was as part of the “Innovations” course mentioned above. Our paper was just accepted for presentation as an “outstanding student project” as part of the Eurographics 2019 Education Papers. 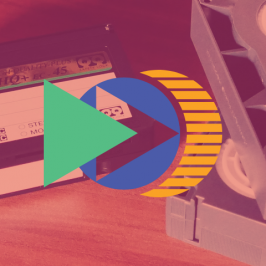 SIGGRAPH: How did you first hear about SIGGRAPH, and what made you decide to submit? 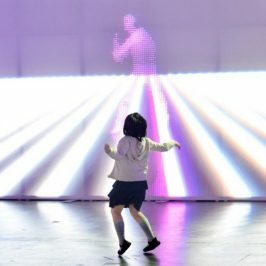 BC: I have known about SIGGRAPH since I started university, and I was always fascinated and impressed with the computer graphics research and innovations that are showcased at SIGGRAPH conferences. For me, [those papers] were always a source for updating my knowledge on the latest graphics advancement, research, technologies, and software. After the project completion as part of the “Innovations” course, I was advised by my project mentor, who has been involved in the SIGGRAPH community, that it would be a good idea to submit my research to SRC based on the technical and visual achievements. Knowing how impressive all past years’ submissions were, just getting selected for SRC was a great accomplishment, let alone winning a few months later. SIGGRAPH: What was your reaction when you found out you won the ACM Student Research Competition? BC: I perfectly remember the day when the SRC final stage was being held and my mind was only focused on trying to deliver a good presentation, mainly to do justice to this project into which a lot of hours went — a lot of effort from my mentor and the university who supported me to attend SIGGRAPH. I wasn’t fully aware of anything that could happen after the final stage, as I mainly wanted to do my best presenting. Therefore, when third and second place were announced and my name was left to be announced for first place, the excitement and happiness instantly filled me and I was so thankful for an amazing and unbelievable experience at my first SIGGRAPH conference. My smile wasn’t big enough to express how elated I was. Immediately after the event I let everyone know about this amazing success, which wasn’t just mine, but belonged to everyone who left even the tiniest mark on the development of this project. SIGGRAPH: How do you think winning a SIGGRAPH will affect your career post-graduation? BC: Winning SIGGRAPH left quite a big mark on my career as it helped me break into the VFX industry. I graduated from Bournemouth University with a degree in computer visualization and animation, and immediately after university I went into an FX Graduate position at DNEG in London. Apart from this professional achievement, having experienced the research process, and the recognition that came with it, made my passion for research greater and I am always thinking and trying to find ideas for a future paper that maybe will take shape one day and which could make use of the research and work experience I am slowly building. SIGGRAPH: Where do you currently work and what do you do in your position? BC: I am currently working as a junior FX TD at DNEG in the film division, so I have all the responsibilities coming with this role. 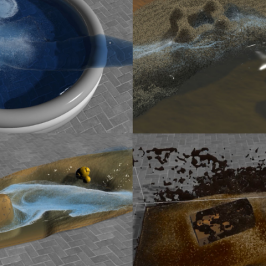 I have been developing procedural tools for FX setups, running simulations for the in-house projects, and getting involved in the VFX pipeline within the FX department. SIGGRAPH: Since SIGGRAPH 2018, what has been your most exciting career accomplishment and why? BC: Since SIGGRAPH, the greatest career accomplishment that I’ve had is to work on two movies as an FX TD: “Greyhound,” which was a great project during which I learned so much from the awesome DNEG team I was part of, and “Venom,” which I joined immediately after SIGGRAPH and very close to its delivery date. SIGGRAPH: What is your best advice for someone pursuing a career in computer graphics? BC: From my experience, the best advice would be to always keep learning and stay inquisitive. It is quite easy to fall into a comfort zone, so if you want to break into the industry and keep up with it you always need to push the boundaries of your skills and learning. And, always strive to find a better, more improved and efficient way of completing projects. Software and technologies are ever evolving and the means to achieve quality products is getting more and more accessible and user friendly; therefore, you should not just be satisfied with out-of-the-box results, but try and find new improved and innovative ways and make them become “out of the box” for everyone else, which would lead you to become part of the computer graphics progress. SIGGRAPH: Share a favorite story from the research gathering process. BC: A fairly big part of my research relied on visual observation of the natural phenomenon that I was going to recreate. Despite the wide range of online resources, I wanted to have my own, real-life references of a withering apple. After finding a good subject for my project, I now had to wait for it to decay — a few days went by and nothing was changed, the apple was still intact; a few weeks went by and nothing looked like it was going to happen, apart from the first stage of the deadline looming. After enough waiting, I decided to help the decaying process by using a rusty nail to introduce a bacteria and kickstart the decaying process. 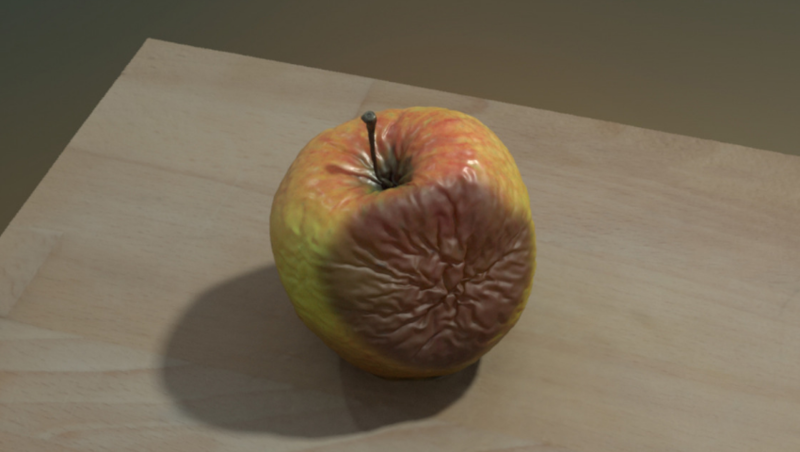 I remember having a discussion with another computer graphics enthusiast during SIGGRAPH who used to travel at sea a lot and tried to do an apple experiment to see how quickly the fruit would rot in that environment. Their story never had an ending as their journey finished and the apple still didn’t show any signs of withering. It’s amazing — and maybe even scary — how well-preserved some fruits can be! Have complete or in-progress research of your own? 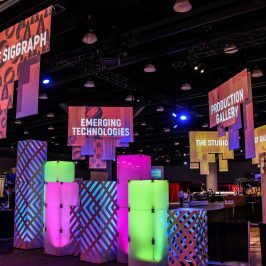 SIGGRAPH 2019 is still accepting work as part of its Posters program through 25 April. Bianca Cirdei is a graduate of Bournemouth University with a degree in computer visualization and animation. She currently works at DNEG in London (United Kingdom).